Latest publication recognizes most sustainable institutions overall and in 17 sustainability impact areas. PHILADELPHIA, PA, USA, August 24, 2018 /EINPresswire.com/ — The Sustainable Campus Index (http://bit.ly/2wbHhZh), a publication by the Association for the Advancement of Sustainability in Higher Education (AASHE), recognizes top-performing colleges and universities overall and in 17 sustainability impact areas, as measured by the Sustainability Tracking, Assessment & Rating System (STARS). The report also highlights innovative and high-impact initiatives from institutions that submitted STARS reports in the most recent calendar year. Institutions that achieved the top spot in each sustainability topic area are listed below. The full list of top performers are provided in the report. The full list of top performers is provided in the report. STARS is a transparent, self-reporting framework developed by AASHE for colleges and universities to measure their sustainability performance. With over 900 participating institutions, STARS is the leading tool for measuring higher education sustainability performance. 164 reports were submitted in the most recent calendar year, resulting in a 27 percent increase over the previous year and a fifth consecutive year of growth. All reports are publicly accessible on the STARS website. 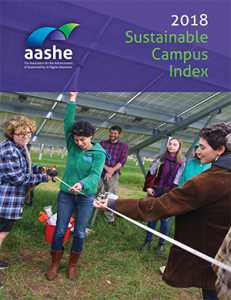 AASHE empowers higher education administrators, faculty, staff and students to be effective change agents and drivers of sustainability innovation. AASHE enables members to translate information into action by offering essential resources and professional development to a diverse, engaged community of sustainability leaders. We work with and for higher education to ensure that our world's future leaders are motivated and equipped to solve sustainability challenges. For more information, visit www.aashe.org.